Baking with apples is definitely one of my favorite things to do in the fall. We’ve already been back to the local orchard twice this season to get orchard fresh apples. They really are better than any apples I’ve ever gotten from the grocery store. I think I’ve eaten at least 1 of them a day since the first time we went to pick them in September. Before we eat all of the apples up, I decided to try out some new apple recipes before Fall is over. 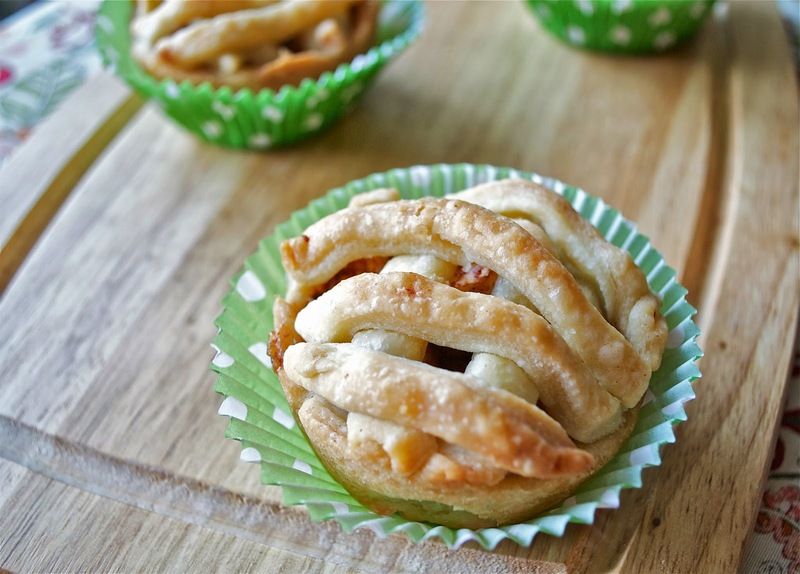 I used Golden Delicious apples we had to make these adorable Mini Apple Pies. They were super easy and not time consuming at all. We added a little Cool Whip and caramel sauce on top when we ate them to make them even better! 1. Preheat oven to 425 degrees. Line your work surface with wax paper or sprinkle with flour. 2. Roll out pie crust and cut out circles using a 3 or 4 inch circular cookie cutter. Gather any scraps, reroll with a rolling pin and cut out a total of 10 circles. Press each into an ungreased, regular-sized muffin tin. Set the left over dough aside. 3. In a medium bowl, mix together apples, sugar, flour, cinnamon, nutmeg, vanilla and melted butter. Divide the mixture evenly among the muffin tins. Roll out your leftover dough and cut into thin strips with a knife or pizza cutter. Place the strips in a lattice design over each of filled muffin tins. 4. Bake 18-20 minutes, or until crusts are golden brown. Remove from oven and cool on a wire rack for at least 15 minutes. Serve warm.